"We show Julianna the importance of doing the projects for the people para magkaroon siya ng compassion. Julianna is also one of the lucky kids who is able to eat three times a day. We show her that these are the people who cannot even afford to eat once," says Richard Gomez about the feeding program he and Rep. Lucy Torres-Gomez initiated. 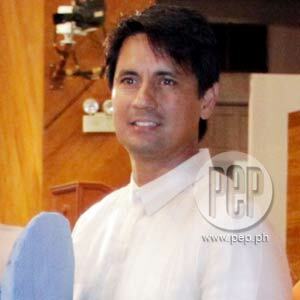 Recently, naging active si Richard Gomez tungkol sa kanyang views sa pamamagitan ng kanyang Twitter account. He started a new account last May and he's been able to share his views and exchange ideas with other personalities. He also keeps people updated with news about his wife, Leyte Rep. Lucy Torres-Gomez. "I've had my Twitter account for a long time already. I was just very inactive. I first saw Twitter on CNN about two or three years ago. Kapag may time ako mag-computer, bubuksan ko ang computer ko," Richard told PEP (Philippine Entertainment Portal) before his taping for My DSL: My Darling Sweet Lover, his new television series for TV5, in Mandaluyong City. Sa recent post ni Goma, tinatanong ng aktor kung bakit walang nagtatanggol kay President Noynoy Aquino tungkol sa krisis na kinahaharap nito ngayon, lalo na patungkol sa Quirino Grandstand hostage crisis. Binabato kasi ng puna si PNoy tungkol sa paghawak ng kanyang gobyerno sa naturang insidente, na kumitil sa buhay ng walong Hong Kong nationals. Paliwanag ng aktor, "Dapat yung mga tao ni Noynoy should really focus on what the president really wants rather than what they want to do for their personal ambitions. Kasi medyo the way I see it, medyo mayroon silang mga kanya-kanyang gustong puntahan. I think it's about time that Noynoy makes sure na buo ang grupo niya. "In fact, the other day, I wanted nga to tweet, Noynoy will have to be very careful with his crisis committee. Noynoy will need to have a good and strong crisis committee who can really stand up for him. If you compare GMA's [Gloria Macapagal-Arroyo] crisis committee, you have the likes of Raul Gonzales, na kahit binabato na siya ng mga tao, he was still there to stand up for GMA act as a wall." LUCY'S CHIEF OF STAFF. Sa mundo ng pulitika, aktibo naman si Richard sa pagtulong sa kanyang misis bilang chief of staff nito. "Ang daming trabaho!" natatawang pahayag ni Goma nang tanungin siya ng PEP sa bagong papel na kanyang ginagampanan. "Even if you're sleeping, you're still thinking. Sometimes I wake up in the middle of the night and I have to do this." Sa busy schedule nilang mag-asawa, inilalaan nila ang Monday to Wednesday sa Batasan sa Quezon City. Nasa Ormoc naman sila tuwing Thursday to Saturday. Sunday naman ay para sa noontime show ng TV5 na P.O.5. Ani Richard, "The good thing about the Lower House is there's a mix of people, not just lawyers, which is good for creating laws. You have farmers, you have businessmen, you have athletes. You have people from all walks of life. That's the way Congress should be. "Yung sinasabi nila na dapat abugado ka to be in Congress, I feel that's wrong. Congress is really for people of all types. You have a feel on what really happens on Congress." Nagpapasalamat na rin si Goma sa nangyari nitong nakaraang election kung saan naging substitute niya si Lucy sa pagtakbo bilang kinatawan ng ikalawang distrito ng Leyte. Originally, si Richard ang tumakbo ngunit may disqualification case siyang hinarap during the campaign period kaya si Lucy ang pumalit sa kanya. "Siguro, I'm a big threat to other politicians, that's the way I see it," sabi niya. "A lot of people, when I entered the scene, 'may kalaban!' Maybe that's the way they see me. They think that I'm a threat. But the fact is, I just want to do something good for the people. "It's good now that Lucy is the one who's seated. She's more relaxed. As compared to me na very aggressive, na full of heart. Sometimes, I really get emotional, especially when there are issues. Sabi siguro ng Diyos, 'Huwag muna ngayon.' Siguro gusto ng Diyos na mas tempered na ako, mas relaxed." Satisfied naman si Richard sa role na ginagampanan niya bilang taga-suporta ng misis niya. "In a way, yung passion ko for politics is also working out. I'm just doing a different role although connected to what Lucy is doing. I'm doing the paper work. I write letters to government agencies. Mahirap na trabaho. Mahirap talaga. "You have to be conscious kung ano ba talaga ang kailangan ng mga tao sa lugar namin. You also have to put in the right words. There's also a possibility that your letter will be rejected or your request will be turned down. For projects to work kasi, you need sufficient funds. Wala pang nilalabas na funds this year." In a recent YES! magazine feature on Richard and Lucy, the couple embarked on their first few days when Lucy began her term. "We already started our sports program in Ormoc," Richard said as he prepared for his scene. "We also have a feeding program. We feed a lot of school children. We've fed around 10,000 children since Lucy started her term as congresswoman. "Maawa ka talaga sa mga bata doon. We found out that there are a lot of malnourished children in our district and there's really a big need for them to be healthy. Schools need extra classrooms. Madami pa. A lot of roads need to be concreted. "We also need to boost the tourism program of Ormoc and her district. We really have to work on bringing industries for us to create more jobs. Ang daming tao doon. Siguro 55 to 70 percent of people don't have work. Siguro yun yung difficult task para kay Lucy, which is to provide opportunities for people."